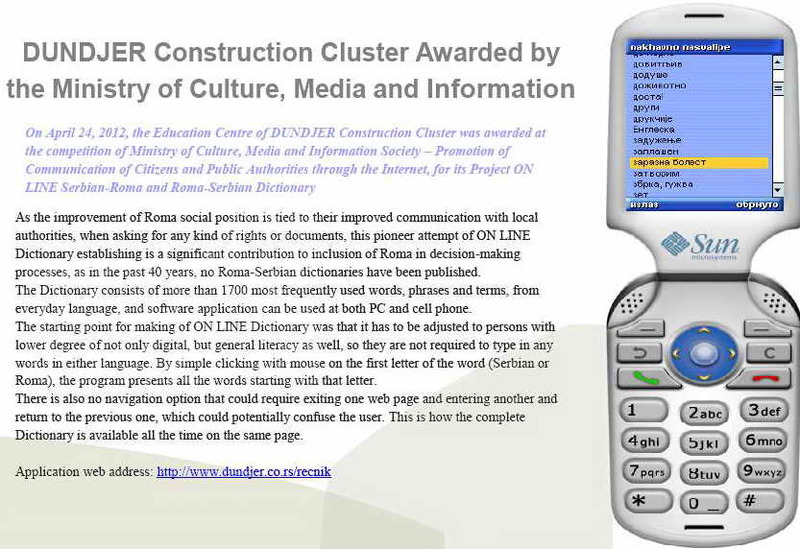 Construction Cluster Dunđer on 24.04.2012. has won the award in the competition of the Ministry of Information and the development of information technology, “Improving communication between citizens and public authorities through the Internet”, for the project ON LINE Serbian-Roma and Roma-Serbian dictionary. 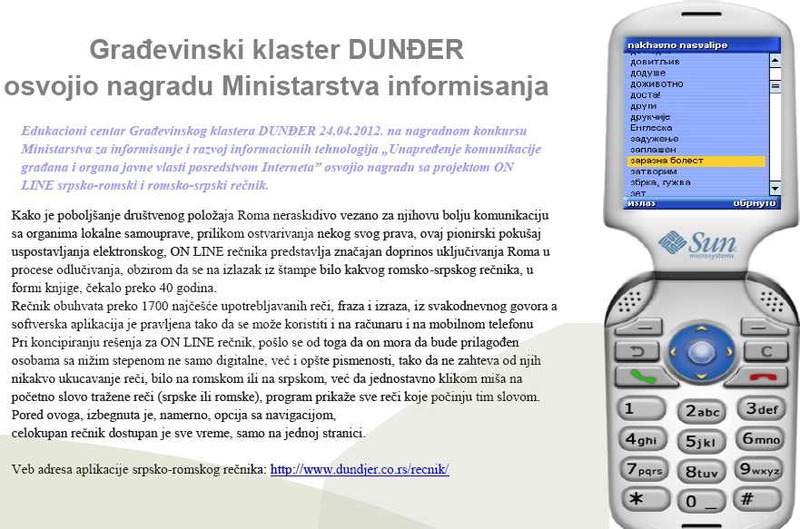 Građevinski klaster Dunđer 24.04.2012. godine na nagradnom konkursu Ministarstva za informisanje i razvoj informacionih tehnologija “Unapređenje komunikacije građana i organa javne vlasti posredstvom Interneta”, osvojio je nagradu za projekat ON LINE srpsko-romski i romsko-srpski rečnik. The Dictionary consists of more than 1700 most frequently used words, phrases and terms, from everyday language, and software application can be used at both PC and cell phone. The starting point for making of ON LINE Dictionary was that it has to be adjusted to persons with lower degree of not only digital, but general literacy as well, so they are not required to type in any words in either language. By simple clicking with mouse on the first letter of the word (Serbian or Roma), the program presents all the words starting with that letter. There is also no navigation option that could require exiting one web page and entering another and return to the previous one, which could potentially confuse the user. This is how the complete Dictionary is available all the time on the same page. 2. For data input into MySQL base, a special program was created through which additional input can be performed, along with update and adding of new and correction of already existing data. 3. PHP script was used for creating the complete web contents of the application, enabling the dynamic link between the database and user of the application. 4. JAVA ME platform was used for cell phone application. 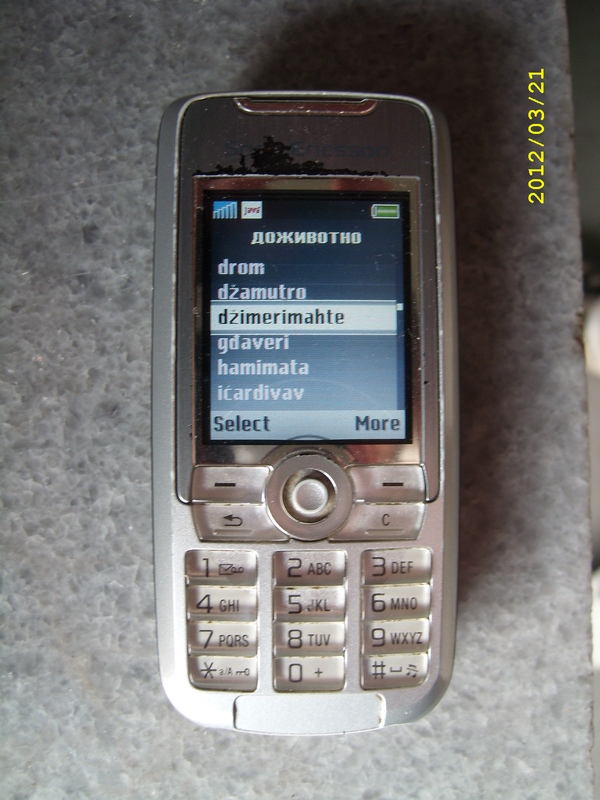 As the improvement of Roma social position is tied to their improved communication with local authorities, when asking for any kind of rights or documents, this pioneer attempt of ON LINE Dictionary establishing is a significant contribution to inclusion of Roma in decision-making processes, as in the past 40 years, no Roma-Serbian dictionaries have been published. However, the classic form of a dictionary, as a book, is considered impractical as it takes a lot of time to find a word, and representatives of the local governments rarely have this kind of dictionary. ON LINE form of dictionary overcomes this problem, as the needed word can be found immediately, speeding up the communication and establishing trust among representatives of Roma population and local authorities, without the language barrier. Also, the ON LINE version of dictionary is more appealing to younger population as it can be installed on the cell phone, being available all the time and making it easier for young Roma to be included into all youth related activities. Because of the low educational structure of Roma, the range of jobs they are eligible for is narrow, so they are most frequently construction workers. But, the issue of Roma language occurs in that field as well, sometimes forcing employers to give up on employing Roma, due to lack of communication. 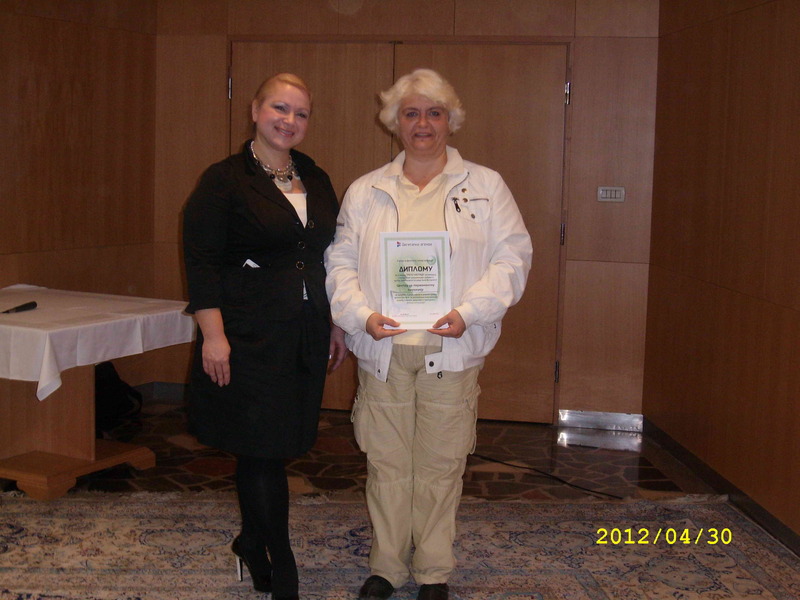 As the unemployment level or Roma population is very high, contribution of the ON LINE Dictionary as a simple tool that is easily accessed would be significant, making it easier for employers to hire Roma. ON LINE Dictionary is a creative contribution to correcting the long lasting social injustice, when Roma people were marginalized and treated unfairly. This is an attempt to teach them (information) literacy, and therefore integrate into all aspects of social life.